All children or young persons 0-18 years who have EMERGENCY TREATMENT FOR SUSPECTED ANAPHYLAXIS OR A SEVERE ALLERGIC REACTION should be referred to the specialist Paediatric Allergy Service via the electronic online referral system located on Staffnet. Provide a definitive diagnosis and identify the cause of an anaphylactic or severe allergic reaction. Perform a risk assessment if a co-existing condition such as asthma and eczema are present. Ensure that families receive the correct advice and a long-term management plan. Ensure that families know which foods the child/young person can eat safely and do not embark on unnecessary dietary restrictions. 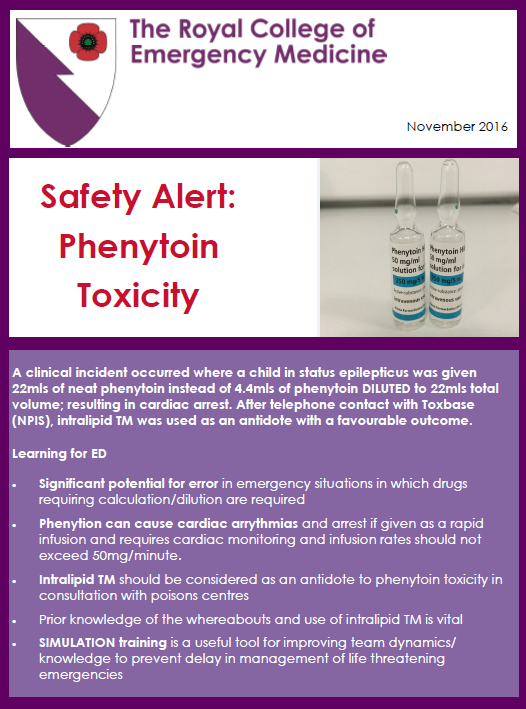 The Royal College of Emergency Medicine has published a safety alert on phenytoin-toxicity following a clinical incident.